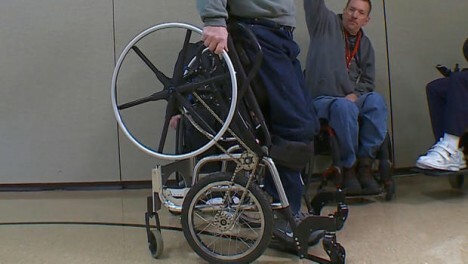 Developed by the Minneapolis Veterans Affairs office in Minnesota, this remarkable twist on traditional wheelchairs allows users to not only ‘stand up’ on demand (including paraplegics) but to move and maneuver while upright as well. Standing wheelchairs are not new, but most lock into position and can only be moved again once the user finishes in one spot and sits back down. 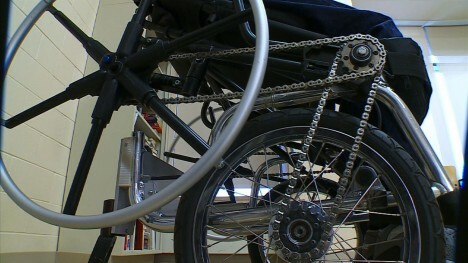 This modified invention allows for more flexibility, using a market-made system with a bottom anchoring pad, removing that anchor, and adding a chain drive allowing the user to move around while upright. See more in Mods & Custom or under Transportation. January, 2016.